Whelp I made a lever, and darned if it don't work. Is there a rule of thumb for making these things? It will work OK on my 130# bow, but this 250# beast is just too much. I'll make another one of heftier proportions. Pictures later, I wanted to get the ball rolling. Maybe not heftier but longer? I'll have to put a pin in the stock, right now I hand span it, but it is kinda hard on the back. I'll get pics tonight. Here it is, along with my powerhouse bow. I don't think I'd want to go much over this draw weight, it is a bit scary, really. The stock is bird'seye maple with walnut. Steel lock parts. I think I need to make the lever about 4-6" longer.The top of the lever which is not installed for the picture is about 12" long. Instead of the brass screws I used a threaded rod, it gives some rigidity. I couldn't find the rod for the picture. So... how does this "not working" manifest its self? I have a sort of hunch that I understand the problem, but it would help to see what it all looked like when the string was drawn back as far as it will go. That's just it, I can't pull it back more than half way. I can pull it further without the handle on it. I think it needs to be longer because the angle increases too quickly to give me the leverage I need later in the draw. Being a compound curve, I can't really math it. When I measured for it I used an elastic band, and it reached the lock just fine. Under load it also lifts the string off the stock quite a bit, it didn't do that with the band. I'll try to get a photo spanning it when I have another pair of hands to take the picture. My best guess at the moment is that your leverage is "maxing out" too soon. Moving the pin back farther from the nut may be what it needs. I look forward to seeing further pics, including ones with the elastic band if possible. Your region of maximum leverage will be the green curve. When the pin is acting in that area, the string should be nearing the nut. If we presume that the string will be in the nut at the end of that curve, then the blue line from the end of the curve to the hooks should equal the distance from the fulcrum pins to the nut fingers. If we move the fulcrum pin back (and up a bit) on the tiller, so that the lengths of the green lines are about equal, we find the the "legs" of the lever are not long enough to reach the pin. --The first is the the distance form max leverage point to the hooks is too long for the distance from fulcrum pin to the nut fingers. --The second is that the legs are too short for this bow's draw length. You might be able to make it all work if you move the pin back and raise the brace height to shorten the draw. If raising the brace is not an option, you are gong to have to make a goat's foot with longer legs for this bow. phuphuphnik wrote: Being a compound curve, I can't really math it. Screw math! I think we are better off turning it into a diagram or a model. Try making up a two dimensional model by driving a pin into a side view of the bow. Make up a "lever" and hook in cardboard or thin plywood, pivoted together with whatever is convenient. Put it through it's paces and watch what happens. This is a cheap way of understanding the geometry. You can just keep making up new cardboard levers till you get one the looks like it will do the trick. I have a question, what should be the maximum draw weight one can pull with such a goats foot?, (provided that the geometry is ok). Geezer here: I have had some experience with goats foot (gafa) levers. In the illustration above, you can change the geometry by three means... either lengthen or shorten the hooks that grabe the string, lengthen or shorten the 'legs' that fit over the gafa-pin behind the lock, or move the pin itself. I suggest making a thin wooden mock-up to establish what works best. Period bows that use the gafa normally mount the thru-pin about 2 inches behind the lock. 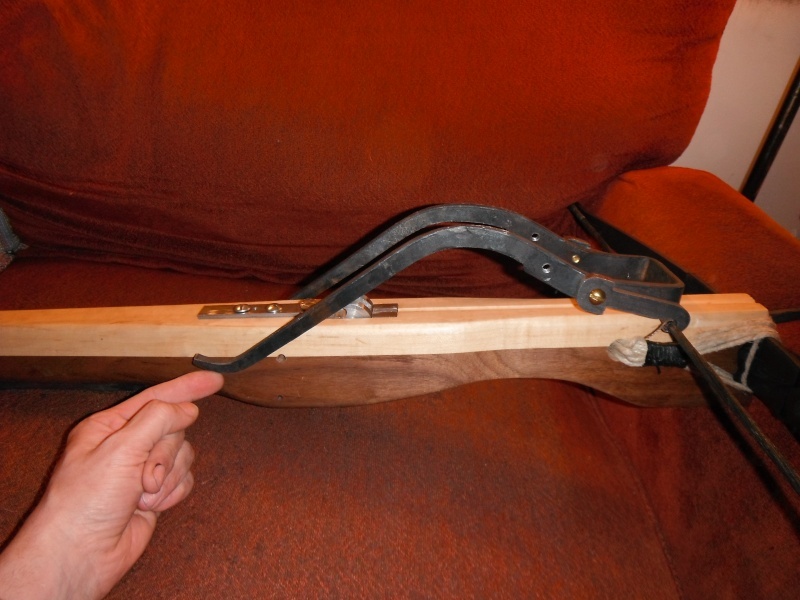 Usually the pin lies near the top of the stock, but some English 'latch' type bows use a combination trigger pin and lever- pin, and mount it near the bottom of the stock. I can see some advantages in putting it low, but haven't tried it myself. When you actually Use the lever, you'll draw the string behind the lock (it will appear to be too high... you can't possibly get the string into the lock there, but when you let the lever rock forward again, it will drop the string neatly into place. Maximum draw weight for a 'gafa' bow? I figure about a 5/1 leverage, so say a maximum of around 500 lb. draw without strain on your body. Geezer. Note one of the biggest problems with goatsfoot levers is actually string-wear where the lever hooks on. Either make your hooks very wide and smooth, or figure on extra serving on the bowstring where the lever makes contact. Geezer. Postscript concerning the 'hooks' on the gafa (that grab the string) Note if you will how wide the hooks on a cranequin (cric or rack) where they make contact with much fatter bowstrings for much more powerful bows. They're made VERY wide and smooth for the same reason. Geezer.